There are some 258 million global migrants, such as these Syrian refugees attending a class in Jordan. Humanity has always been on the move. Throughout history, we have migrated in search of new opportunities, as well as to escape persecution, conflict and poverty. Movements of people happen all around the world. But although migration is a global phenomenon, there is still no global understanding of how to manage it. Today people are moving more than ever before. 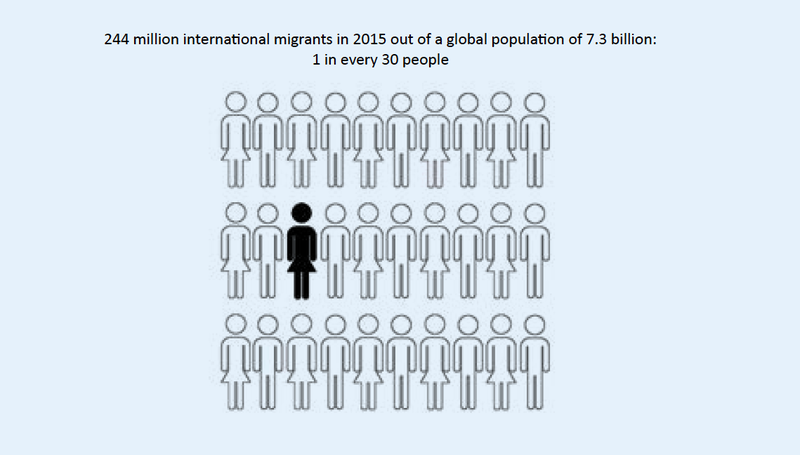 There are presently around 258 million international migrants. That figure has grown rapidly since the turn of the millennium, when there were 173 million. Together with the increasing volume, we are seeing changing demographics, advancing technology, evolving needs of labour markets and continued challenges posed by wars, shortages, human rights violations and climate change. We sometimes think of certain countries as sources of migrants and others as recipients. But most nations today experience migration from all three perspectives – as countries of origin, transit and destination. It is against this backdrop that the 193 Member States of the United Nations unanimously agreed in September 2016 to negotiate a global compact for safe, orderly and regular migration. But while this is an intergovernmental process, we have worked hard to ensure that we are getting input from all sectors of society – from grassroots civil society organizations to multinational companies to migrants themselves. Over the past year, through our consultations, we have learned a lot about human mobility. For example, there is more migration between countries of the global South than from there to the global North. Asia hosts the most migrants, with 80 million residing in the region. And remittances represent the largest source of external finance for many developing countries, way ahead of official development assistance. It has also become clear that we cannot just look at migration at the national level. This will not tell us the whole story. After all, in a single country, you might have one city with a high migrant population, but then almost no migrants living in a town an hour away. Looking at countrywide statistics will not necessarily tell us how migration is affecting individual schools, hospitals, universities, or businesses. It will not take into account varying local customs. The high number of people crossing borders means that we need to work collectively to manage migration. We need to think globally. The reality of migration as seen in statistics does not always correspond to what we hear in public discussions. 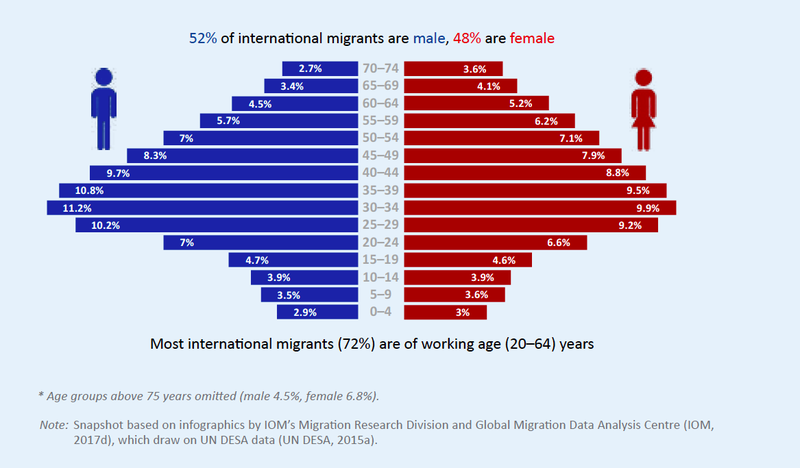 If migration is managed properly, migrants can boost economic growth by filling gaps in fast-growing sectors and by increasing the working age population. In general, migrants pay more taxes than receive benefits. Newcomers also enrich the cultures of their host communities, and those who return to their countries of origin bring back new skills and ideas. Yet irregular migration is a continuous challenge that exposes migrants themselves to exploitation and abuse. And host communities also have legitimate concerns that we need to listen to. Of course, governments decide on their own migration laws and policies – whether they have to do with security, education, health or employment. They have done this throughout history. They do it today. And they will continue to do so after we have adopted the global compact. This is why they will be the main drivers of the negotiations, due to start in February 2018. No one is threatening state sovereignty. All United Nations Member States already reiterated that. While working to address migration, we cannot forget about human rights. All people are born with fundamental rights and dignity. That includes migrants. In that regard, throughout the talks we have had so far, I have been heartened to see the broad consensus on the need to protect the human rights of everyone on the move. I have also seen agreement that migration should be a choice, not a necessity. But it is not enough for the global compact to reiterate general principles – it also needs to include actionable commitments that can make migration safer, more orderly, and better regularized in reality. It should have an adequate follow-up and review mechanism to make sure that these commitments do not just remain words on paper. It is not easy to leave one’s homeland and start a new life. Behind every migrant family and host community is a story. The stories can be positive or negative, but we cannot hope to understand migration without hearing them. Overall, there is an urgent need to move from fractured perspectives to a shared understanding, and a commitment to do things better. Throughout all the discussions, I have not heard a single voice arguing that our current response to international migration is sustainable. In fact, what I have heard instead is a resounding rejection of business as usual. That is why the preparation of this global compact is one of the key undertakings of the 72nd session of the General Assembly. As the United Nations is the world’s center for multilateralism, I consider this to be an urgent test for our Organization. No single country can manage migration on its own. This is exactly the type of issue that the United Nations should be dealing with. It is time for us to lead the charge.